This year, Brown Street Park’s summer concert series will occur on every Wednesday during the month of July from 5:00pm-7:00pm. We have an excellent line-up of local bands that will be sure to entertain. 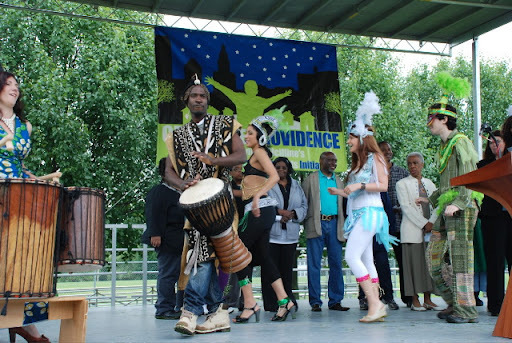 We are thrilled to the support and sponsorship of the City of Providence, David N. Cicilline, Mayor, the Department of Art, Culture + Tourism, and the Parks Department, Whole Foods Market University Heights, Brown University, Logica and Graphic Innovations. We are always need volunteers to help set-up our welcome table, erect a dog fence, and then break-down those items. Volunteers should please send an e-mail to: concerts@friendsofbrownstreetpark.org. About The Wippets: Voted "Best Roots Act" in the Providence Phoenix, 2009 and Nominated as "Best Folk Act" by Motif Magazine, 2009 The Wippets formed in 2002. It’s hard to define exactly what type of music we play. We're a little bit jug band without the jug, a little bit skiffle band, a high energy trio doing originals and covers of both the familiar and the obscure. We play at outdoor fairs, private parties, local clubs and coffeehouses…anywhere there are people who want to have a good time. About Superchief Trio: Superchief Trio features a unique combination of two-fisted piano, red hot trombone, powerful vocals and frenzied percussion antics, all rolled up into one small package. Swing, New Orleans R&B, jump blues, boogie-woogie - it's all in there. And with a repertoire of tasy original tunes and carefully selected covers by Professor Longhair, Huey Smith, Smiley Lewis, Wee Willie Wayne and a raft of others, this group is the ultimate dance-party band. About Infusion Experience: Infusion Experience plays original music with a flamenco Afro-Cuban flair. It is the combination of our diverse backgrounds which creates something powerful and emotional. The rhythmic nature of the band produces a hypnotic feel that levitates people from their seats, while the strong and attentive groove draws them to the dance floor. Since the founding of the band in 1999, we have tried to keep our music fresh and interesting while always expanding the boundaries of our sound. This is the Infusion Experience.